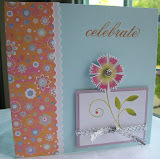 These are the other three cards from a stamping party I hosted on Sunday. It was another intro to card-making for my non-stamping girlfriends. I posted the Mother's Day card I had them make the other day. They loved playing with all the paper punches, stamps, and inks. They laughed when I pulled out my Crop-A-Dile to set the snaps for the Father's Day card! They couldn't imagine that we use such a large tool for paper crafting. I made this card for Taylor's weekly cupcake challenge. I didn't use a cupcake stamp. Taylor's sketch challenge came in handy. 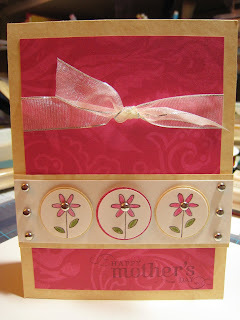 I used the sketch today to show non-stamping girlfriends how to make a Mother's Day card. 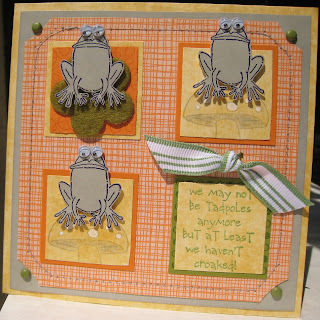 Theresa from Addicted to Stamps & Scraps asked us to CASE (Copy And Share Everything) a card from the Stampin' Up Regional Conference in Milwaukee. The first card is the card I chose from Theresa's blog entry. This is my interpretation of that card. I don't have So Saffron cardstock right now, so I stamped the scallop stamp with white ink and embossed it on white cardstock. I rubbed So Saffron ink on the paper. 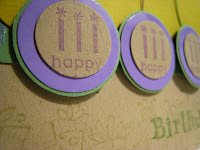 On the love stamp, I used two types of ink (StazOn & Stampin' Up) to get a double image of different shades of black. Stamps: Wonderful Words, Too Terrific Tags, So Many Scallops, and I don't remember the set the background stamp comes from. Paper: The only SU paper is a tiny piece of Wild Wasabi. 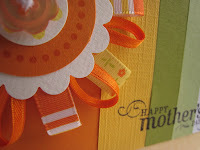 The other paper is white cardstock and light pumpkin cardstock. The nice designer paper is a gift from my friend, Ericka. Gracias, Ericka! It took me a long time to come up with a design for this challenge. How to use Sahara Sand with these other colors, was the challenge for me. 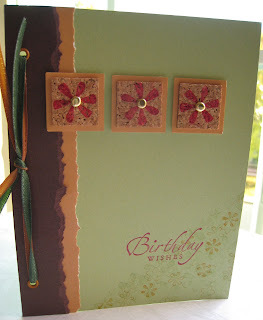 I decided to embrace the color and use it at the focal point of the card. I love the layout challenge Taylor gave us last month. I've used it a few times (here and here) and I love it. I decided to use it for Kristina's color challenge. I also wanted to use some of the blog candy Theresa gave me on this card. Thanks, Theresa! I used a flower from Flower Fusion for the lily pad and some Wild Wasabi ribbon. I also did some sewing on the border. My stitch length and tension is not what I wanted, but I didn't have time to fool around with the machine settings. Today I used a quick card layout I saw courtesy of Alli Miles. 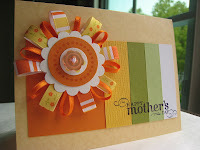 Last week, I saw a cute ribbon flower card created by Annabelle at Bits and Pieces. I have so much ribbon...don't we all? I printed out a picture of her flower with intentions to try to make one myself. Then on Sunday, Kristina posted 2 YouTube videos (part 1 & part 2) from a user called "okakuku". I loved her ribbon and button creation. That was the final motivation to create one myself. This weekend, I'm giving non-stamping girlfriends another intro to stamping (I did this two years ago and a few years before that). 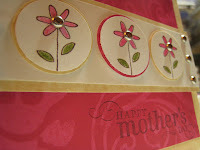 We are going to make at least 4 types of cards: Mother's Day, Father's Day, birthday, and thank you. I haven't decided if they will make this card...it might be a little too time-consuming...I used real needle and thread on the button. This is probably the last time I will use this cupcake for Taylor's cupcake challenge. 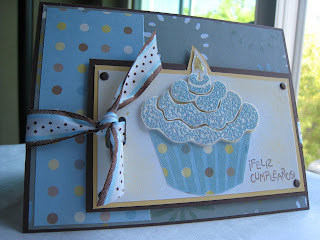 I ordered Hey There Cupcake from Eclectic Paperie a few days ago. I know I don't need to use a cupcake stamp for this challenge, but for me, it's got to be a cupcake. I had already photographed and uploaded the photos when the top layer looked a little bare...too late to add brads. I added faux brads to the 4 corners (I used my Crop-A-Dile to emboss Chocolate Chip a little too hard. The tiny circles where then glued on). 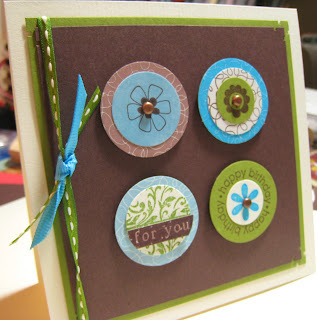 In this week's challenge, Theresa from Addicted to Stamps & Scraps asked us to give our favorite "go to" layout. I don't feel like a have a "go to" layout anymore. That's why I love all the layout and color inspiration challenges. I'm having to think outside my normal box, so it's changing how I create new cards. I made this card 5 years ago exactly (I obsessively date the back of everything I make and save a copy of everything I've made for others...who else does that?). 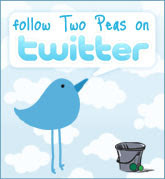 This represents what used to by my "go to" layout. * I mainly used the standard A2 size of card. * The orientation of the card was usually vertical. * There was never anything too bulky on the card (for mailing purposes). 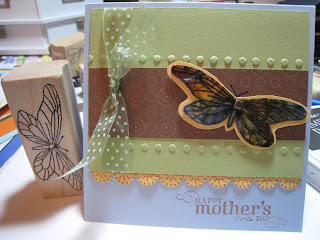 * The main stamped (or in this case, embossed) image was centered and had some layering. * The greeting was centered on the width of the A2 card. 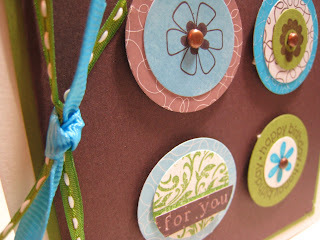 I have done some similar layouts on this blog, for example: Cupcakes are Good for You and Paper Pierced Flower. But, a girl has the perogative to change her mind! I'm liking a square-shaped card these days. I've done a few swaps with my good friend, Ericka. I've always admired her work. 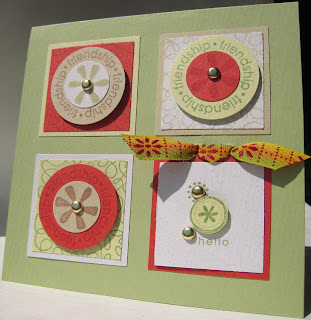 One thing I admire is she creates cards in a variety of sizes and orientations. She just created a blog today. I used my Crop-A-Dile to do the dry embossing. I used the reinkers for the 4 colors, Diamond Glaze, Pearl Ex, acetate, and the tissue paper that comes with acetate to do create the butterfly. This technique comes from MaryJo McGraw. I don't have a Stampin' Up corner rounder to create a scalloped edge, so I create my own by punching out several 3/4" circles and attaching them individually. 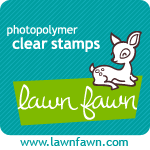 Today I signed up for Jen Tapler's Stampin' Out Alzheimer's event to benefit the Alzheimer's Association. 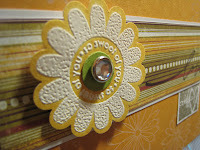 It's a week-long paper crafting event that starts on May 3rd...which is National Scrapbook Day. Jen is a talented paper crafter that lives in Maui (my favorite place). Her father was diagnosed with the disease. I'm doing this event in honor of my friend Cris' mother, Natalia Vargas, who was diagnosed a few years ago. The cost is a minimum $5 donation. Anyone can participate. 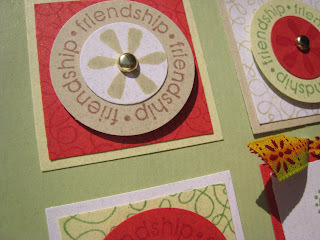 Jen will post the challenges (scrapbooking, card-making, 3-D, and altered projects) late on May 2nd. There will be cool give-aways. Even if you can't participate in the challenges, you can still sign up and be eligible for a Grand Finale give-away at the end of the week. Join me for a good cause! There were no stamps used to make this card; only rub-ons. This card was made for Theresa's rub-on challenge. 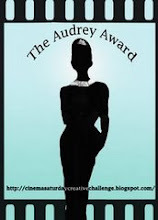 I used Beate's weekend sketch challenge #43 as the inspiration for my layout. Cupcakes are Good For You! Here's my entry for Taylor's Cupcake Challenge 11, which was a color and not a layout challenge. I don't think I've ever used Green Gable. I'm glad it was part of the challenge. I only have 2 cupcake stamps, so once again I'm using the same ones. Taylor said we didn't need to use a cupcake stamp, but I was being persistent. I need new stamps! This time I used masking to add the phrase "good for you!" to my cupcake stamp. 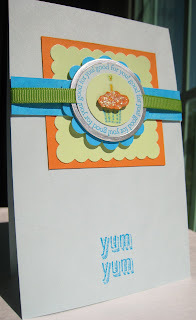 I also used masking on a tag stamp to get the "Yum Yum" phrase, without the surrounding tag. 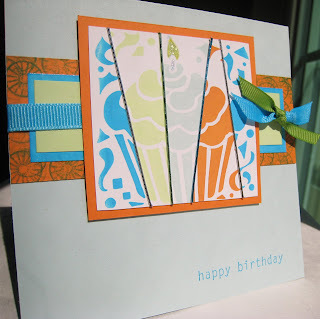 Here's the first card I created for Taylor's Cupcake Challenge 11. I wasn't completely satisfied with the colors of the cupcake, so I created another card. I was reminded of using mizuhiki cord by browsing MaryJo McGraw's blog. I like this technique, but it's better-suited for paper mosaics...just like MaryJo McGraw does. I had all the ink colors, but only Old Olive and Chocolate Chip cardstock. I made this card for Theresa to thank her for the Blog Candy. I received a new set of stamps (Stampin' Up Birthday Whimsy) from her last week for a drawing she had on her website a few weeks ago. I love the set. Here's my entry for Taylor's Cupcake Challenge 10. I love her layouts. I forgot I had this large cupcake stamp. I bought it at least 8 years ago, but I don't know what company made the stamp. 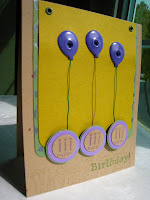 I made this card for a friend who celebrates a birthday on Saturday. I also made this card to join Theresa's color challenge. Just to show you I am addicted to this craft, I have a sore throat and a slight fever and I still wanted to create this card. I'm truly sick, and I don't mean physically. I'm not completely happy with the card, so I may tweak it a bit before I mail it out tomorrow. Any comments would be welcome. I made this card for my nephew Stephen who turns 3 tomorrow. For the first time, I used this week's card sketch from Card Positions Systems as my inspiration. Here's another attempt at using Taylor's 4-quadrant layout. This is my last card for a swap I'm doing with Ericka.